23-Sep-2006 -- This is the 13th confluence visit on a bicycle trip from China to Central Asia. The story starts form 32°N 107°E. After a successful visit of 45°N 82°E three days earlier, we decided to attempt this confluence which is 20 km beeline from the town Üsharal (“three lakes”) where we had spent the night. According to our map, the confluence is located near a village called Töngkeris. Before leaving Üsharal we asked for the directions to that village. Nobody seemed to have ever heard about a place name Töngkeris, only a taxi driver slightly knew about it, but he said the road was rough. With our mountain-bikes we should be able to make a short-cut by directly going south. The first 12 kilometres towards Dostiq were a pleasant ride on the sealed main road. At a distance of 9 kilometres beeline to the confluence, we turned off from the main road and reached a little dam with a gate. The gate keeper was astonished to see foreigners here but he let us pass. The track turned out to be extremely rough. Even pushing the bikes was an exhausting act. After crossing an 800 m high pass, the track had such a steep grade down, that we had to push the bikes again. At a remaining distance of 1 km it was time to leave the track and head towards the Temek River. Elionora felt exhausted and decided to wait with the bikes while I would run to the confluence. I put on my running shoes and equipped with nothing else than camera and GPS I ran across open fields (for the first 300 m), then through dense river vegetation (next 300 m) and finally I reached a little stream. Now the confluence was really in reach with being only 260 m from my current position. At that time, I never would have guessed that this visit would end up unsuccessful. I simply couldn’t cross the river! I tried at several places, reached some islands in the middle of the stream; I found some fallen trees to cross over some branches of the river – but I never was able to make a complete river crossing. The actual problem was not to simply cross the river (I could easily have swum across) but to make it to the other side with camera and GPS receiver. These are two precious pieces of equipment that functionality would suffer from a soaking bath. The river bed was slippery with round stones covered with algae. The current was enormous and gave me a strong force on my body. I almost made it to the other side – only 2 m out of 20 m (!) left, when I almost fell into the water. In my panic I turned back and decided that it would be easier to explain Eleonora about an unsuccessful visit than about a lost camera and GPS. When I came back to Eleonora, it was already late in the day and we had to find a place to stay somewhere. Riding 2 km, we reached Tönkeris which is nothing else than 2 farm houses. At one house we asked for some tea (“chay”) and were given a feast consisting of bread, cheese and tomatoes. We were not allowed to pay for it. But the farmer’s family was happy to have the pictures sent as a payment. Unfortunately, we couldn’t keep that promise for three long years. Why come the pictures with a delay of 3 years? Our memory flash card of the camera broke two weeks later in Kirgizstan. Several attempts to recover the data failed, until I tried one more time and succeeded. We didn’t want to overstretch the farmer’s hospitality and decided to move on. Just at dusk we reached the main road again near Qabanbay. Tip for future confluence visitors: approach the confluence from Qizilashshi at the A350 and follow a track 25 km straight east. At Töngkeris try to cross the river and follow it 2 km north at the east side. Time at the CP: 2:00 p.m. 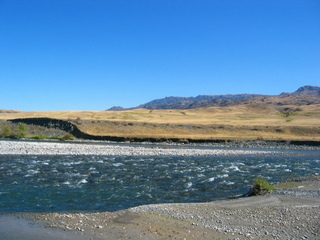 Description of the CP: In Eastern Kazakhstan, near the district town Üsharal. According to my view it is on a river bank with open grassland. #4: One of those "tree bridges"